Ironically, even though Spring Break is this week, I've had to spend more time working on schoolwork than keeping up with the blog. So I'd just like to update a couple of things from last week. First, the UConn basketball team broke their NCAA record winning streak yesterday, beating Notre Dame in the Big East semifinals for their 71st straight win. The only record that stands in front of the Huskies now is the 88 straight games won by John Wooden's UCLA Bruins teams from 1971 to 1974. 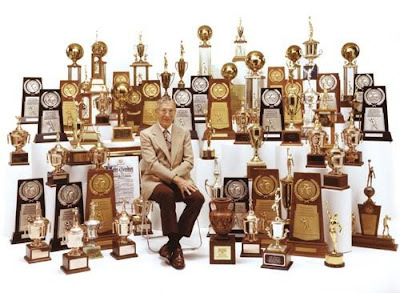 Wooden won 10 NCAA titles in 12 years as coach of the Bruins from 1963-1975. Interestingly, Wooden also has won a trophy for winning the most trophies. Putting the UConn Huskies into the conversation with the Wizard of Westwood and the greatest college basketball dynasty of all time is certainly deserved. Simply put, witnessing this kind of greatness is something special - which makes the following video from ESPN's Jeremy Schaap quite interesting to me. One of the points he seems to make is that the Huskies team doesn't get enough recognition and they should. I always find it a bit disingenuous for a major media outlet to complain that some thing or phenomenon should get more media coverage. Don't you - Jeremy Schaap and ESPN - contribute to the sports conversation? And if you wanted to talk about the Huskies, you would. In a second update, the Cleveland Cavaliers defeated the Detroit Pistons on Friday in front of a sellout crowd of more than 20,000 at Cleveland's Quicken Loans Arena. But, (maybe?) more important than an NBA regular season victory, the fans in attendance set a Guinness World Record for the largest gathering of people wearing fleece blankets. Here's some video of the event. The things people will do for their sports teams, or, is it the things people will do for a free Snuggie?